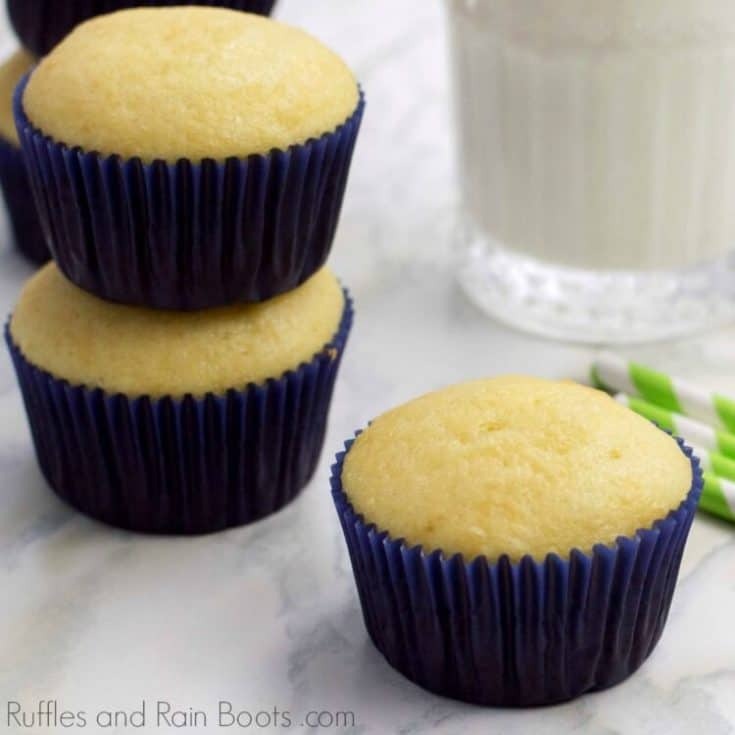 You are here: Home / Food / A Lazy Girl’s Easy Vanilla Cupcake Recipe – Perfect for Kids! 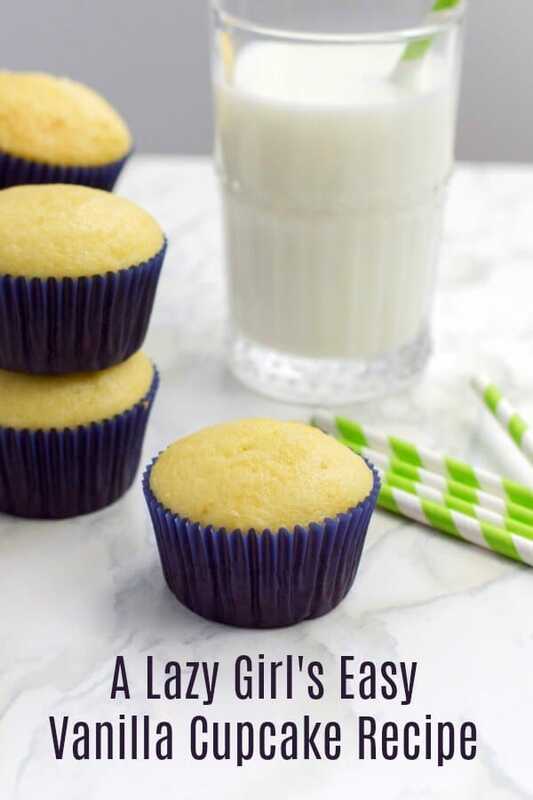 A Lazy Girl’s Easy Vanilla Cupcake Recipe – Perfect for Kids! 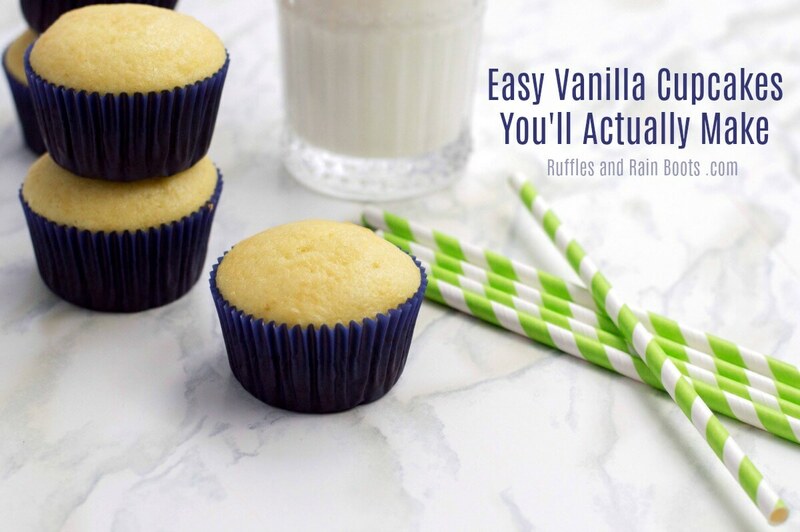 This lazy girl’s easy vanilla cupcake recipe is one you need to have in your recipe box. It’s the basic cupcake recipe to build on, so let’s get started. Here at Ruffles and Rain Boots, we like easy. Super-duper easy is best, but I’ll take just plain ‘ol easy any day of the week. After scrolling Pinterest for party ideas, however, I can feel my blood pressure rising and my mom-guilt right along with it. It seems that there just has to be 3,520,771 ways to make a cupcake when really, all a girl needs sometimes is a simple, easy vanilla cupcake recipe for kids. So yeah, this is that recipe. RELATED READING: Flamingo Cupcakes – An Easy Cupcake Recipe That Looks Amazing! You don’t need a lot of supplies, ingredients, or culinary experience for a basic vanilla cupcake recipe. A few things, however, are important to know. All-Purpose Flour – If you’re too lazy like me to actually go and get cake flour, use all-purpose flour. To get the high-rise look, fill each cupcake liner with 1/4 cup of batter. Ugly Cupcakes – You can fix any cupcake’s unbalanced top or sunken centers with buttercream. Buttercream is your friend. Browned Edges or Tops – See remedy above (buttercream, baby) unless you’ve burned them. Toss them if they are burned, dry, or hard. Oven temperatures vary, so turn yours down or buy an oven thermometer. Frosting – Get yourself a great buttercream recipe (it needs to be stiff) and learn how to frost in your favorite style. Not all buttercreams are created equally. Have you ever been to a party and the cupcakes looked like they slid off the front seat while in transit even though they didn’t? Soft buttercream isn’t the best for cupcakes because the top needs to hold its shape. I promise it will still taste amazing! For a wow-worthy effect, start watching this cupcake decorating video at 4:30 – it shows you how to pipe really impressive swirls. If you have a lot of cupcakes to make, need to pack them up in boxes, or want to extend your buttercream the farthest it can go, watch this basic cupcake frosting techniques video. There are so many cute Valentine’s Day cupcake recipes here. Fun spider web cupcakes are sure to please! Swirled batter and fun additions make these summer fun flamingo cupcakes a hit. This easy vanilla cupcake recipe should be a staple in your kitchen. 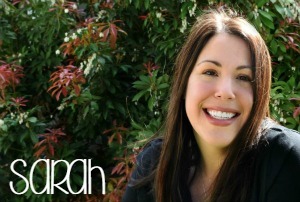 It's the basic building block for tasty flavors and fun cupcake designs. Line a muffin pan with cupcake liners and preheat oven to 350 degrees F.
Using an electric mixer, beat together eggs and granulated sugar. Once combined, add softened butter and vanilla. Mix until creamy. In a small bowl, sift together flour, baking powder, and salt. Alternating with the milk, add dry ingredients to egg and sugar mixture in three equal increments. Mix well. Scoop cupcake batter into the lined muffin pan, filling each cavity about 2/3rds of the way. Bake for 17-20 minutes or until a toothpick comes out clean when poked through the center. Remove your tasty, easy vanilla cupcakes from the oven and let sit for about 2 minutes. Remove each cake from the pan and cool completely on a wire rack. All nutrition information is estimated. Please calculate your own ingredients if accuracy is desired.